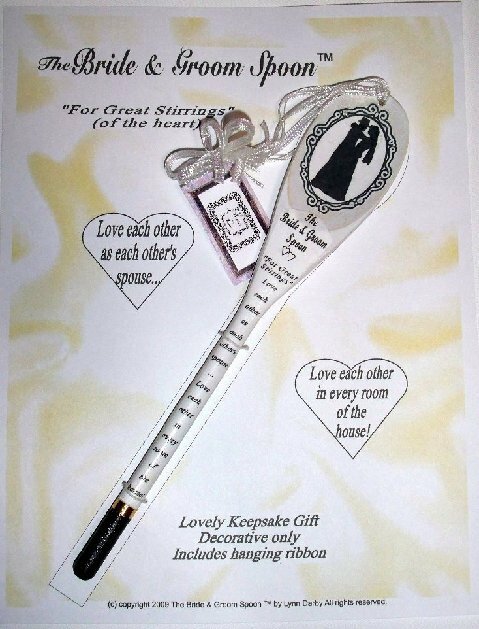 ​Remember, when that Special Unusual gift is at STAKE, why not give them something RARE...and have it WELL DONE by Lynn Darby Creations? Yes, I believe, as portrayed in those formative years as in this photo...that way back then, I knew I would be creative. My sister Judy (in this picture) went on to be a fine artist. 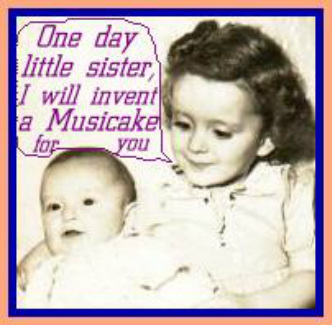 And, Yes, I did go on to invent a MUSICAKE for her. See one Musicake work in a video showing that when you press down upon it, watch it play the Happy Birthday or Happy Anniversay song, while flashing candelites (tm) blink in unison. Samples of Musicakes are just below in a slide show that people previously ordered in various themes and color combinations. NOW, to get an idea of what my line of gifts are all about, I started by observing others in their milestones for themselves and their family members. This is how you are offered something so different. One dear friend says that I put "Lynnfluences" in my gifts. They are always the "Hit of the Party," because they are not everyday store shelf items...these have a personality that makes you want to adopt them. The warm and fuzzies take over...or...you might get that unexpected chuckle! Over the years since it all began, the product line has grown with both time and requests for something different. Some ideas just came out of the blue. Others came about with my own experiences. Also know this: ﻿If your meaningful gift doesn't exist, just request it from me, and I promise you that I will create it for you! ﻿ You see... Imagination runs freely around here, so it gets a lot of exercise! You will see the true difference of the hand-crafted time that gets infused into all these copyrighted creations. That difference means, that they are "Created from the Heart." (c)2014 by Lynn Darby. All rights reserved. 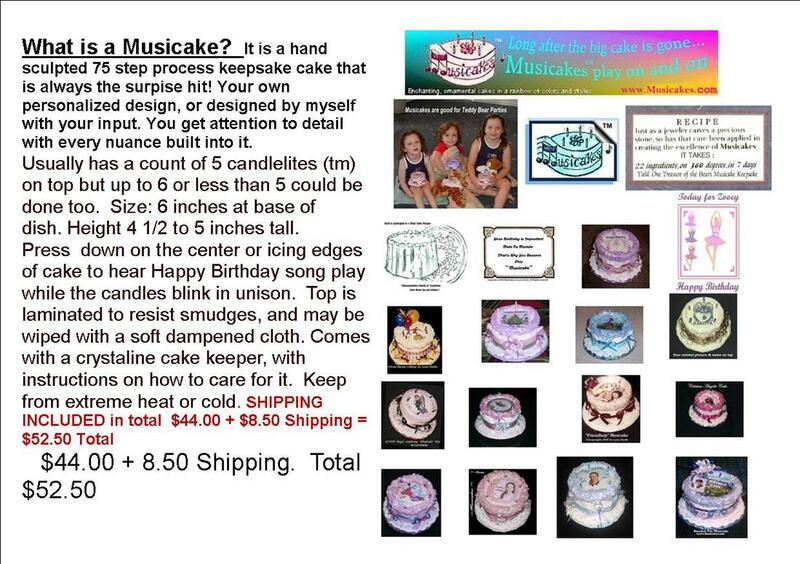 Musicakes / Musical Cakes (keepsake or commemorative sculpted smaller inedible cake) ONE OF A KIND PERSONALIZED. Worthy of a coffee table placement or featured in a china closet. "Long After the big cake is gone...Musicakes will play on and on." Good for 2,000 plays . Enlarge video if you wish. click the 4 way directional arrows on play bar. Just press on middle of Musicake to activate Music and flashing lights. 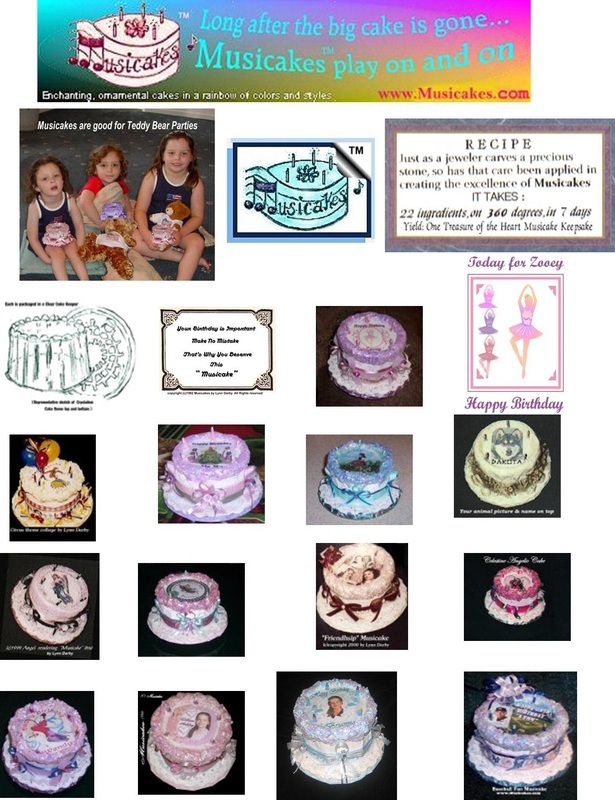 See over 30 samples of differently designed Musicakes on display in the slide show below. You may also click on each to pause one that is playing or click on any of the side column of photos. Tired of everyone picking on your prepping bits of food, or guzzling milk down from the carton? 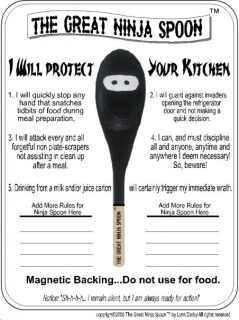 This spoon (with an attached magnet backing) will tell them they are being watched! There is a warning for any kitchen manners infringement will have consequences. Beware! Wooden spoon with magnetic strip on the back of spoon for someone's kitchen fridge. It's a sentinel to protect your kitchen from everyday annoying habits of kitchen visitors. Packaged in a cellophane envelope 8 1/2 x 11. Tag with curling ribbon is attached with card stating "For the Kitchen of________" Also: "From_______"
Side note: A gentlemen gave these out as favors at a party for his wife's birthday! 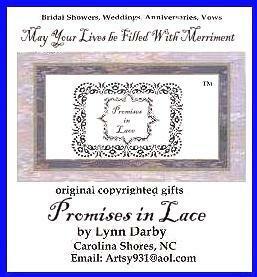 Promises in Lace - Logo for this line of romantic gifts. 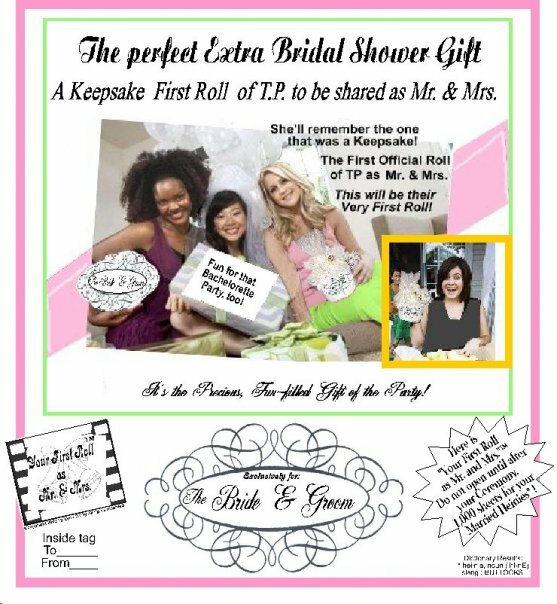 weddings, engagements, anniversaries, bridal showers, & bacheorette party gifts. View Little animation of a few Promises in Lace creations. Click arrow in center of video by Animoto. Click logo card on the left for full screen view. 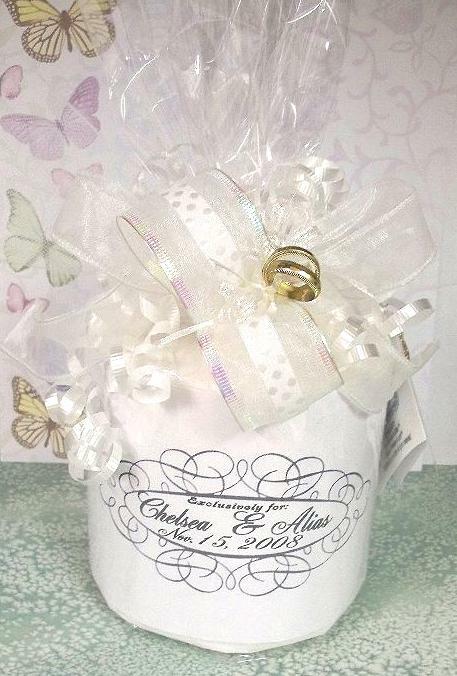 Wedding Cake keepsake topper with or without lights. 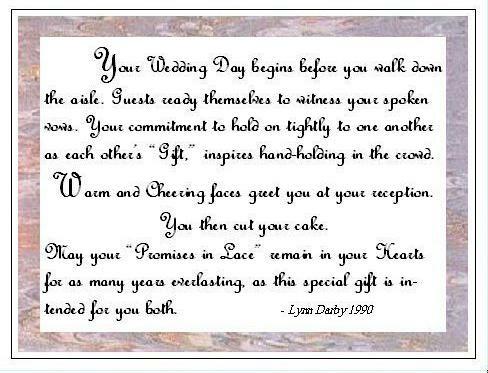 This card comes with all Promises In lace gifts. 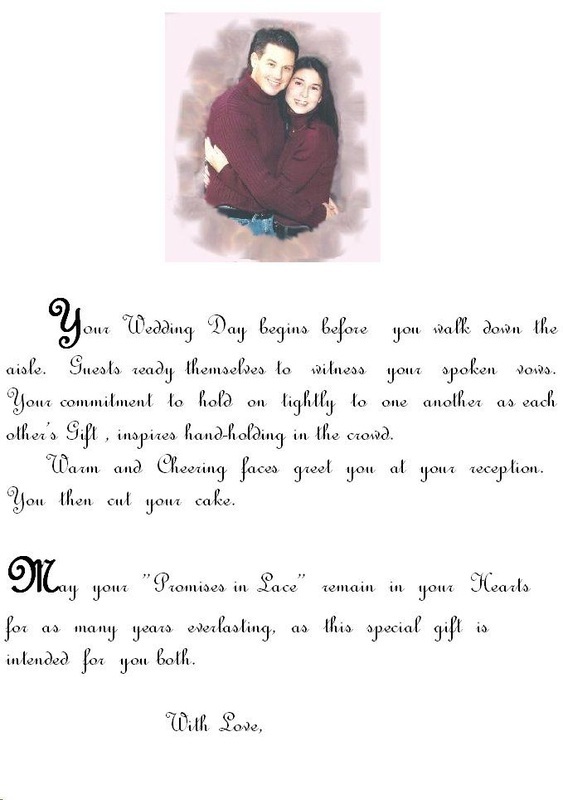 An added gift for the couple. You provide the photo. For frame size 8 1/2 x 11 inches. Poem on hande vertically, "Love each other as each other's spouse; Love each other in every room of the house." (tm) With irridenscent ribbon and bow to hang on door knob of entryway of home or bedroom. Click on image below to enlarge Background tones a. antique gold yellow or lavender tone. Personalizing included free with order. 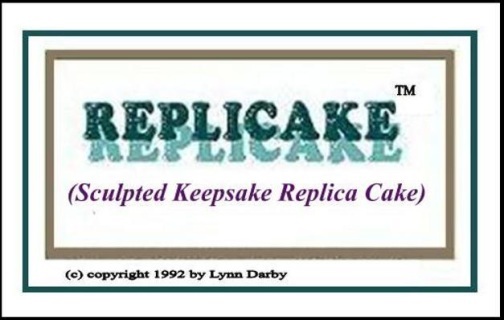 A sculpted keepsake replica of that fancy new specialty cake: for a birthday or a reproduction of an older cake via photo made into a sculputre. After all the work was put into that design, then photographed, cut and served but now it has vanished. 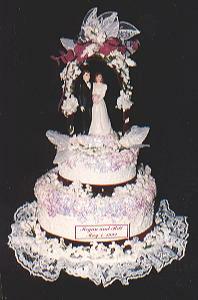 Would you like to see a scaled version of the cake to remember? Send me a photo of the cake via contact info below and I will recreate it via a reasonable fascimile of image and add muisical candles with birthday song and lights. ~or~ Have it made as a silent recreated sculpture. Round Replicakes are 6 inches at the base of plate. Height approx 4-5 inches depending on add-ons (such as higher top bows, etc.). 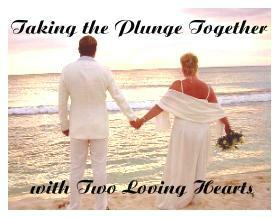 Contact with you is made step by step via email or telephone calls until completion. There are 2 prices: With mechanics:(lights and ANNIVERSARY song) $32.50. Without mechanics: $25. This one below in slide show was $25 WITHOUT MUSIC AND LIGHTS. SHIPPING INCLUDED for either choice. Watch Sample of a Replicake slide show below. 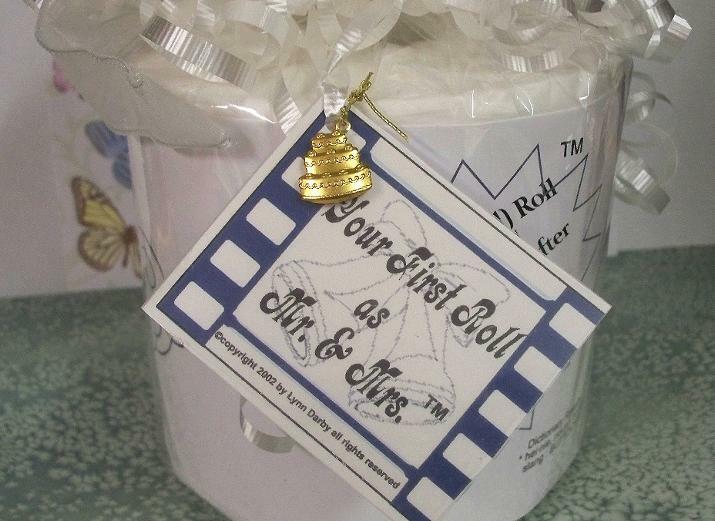 Front of special roll Can be personalized with the couple's names and wedding date on the front of roll. 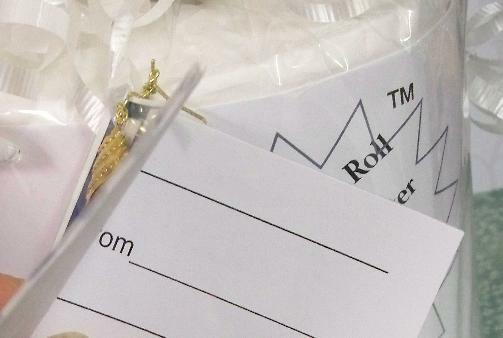 Add $1.00 for personalization WITH names on the front of the roll. Great for a Bridal Shower, Bachelorette party, or given at their rehearsal dinner. Copyrighted punchline on back "1,000 sheets for your Married Heinies" Comes with a brass or silver charm of a 3 tier wedding cake. See samples below. $6.00 + 4.00 mailing SHIPPING INCLUDED in total Made to order. Order here by clicking on Add to Cart. Any Questions? Fill out form at bottom of page. Traditional length plunger handle or it can be shortened. Color White. Need anything added? Contact below. 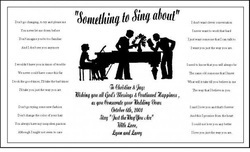 $10.99 + $6.00 mailing 12 will be made in 2013 2 week lead time. When that unique gift is at STAKE, why not give them something that is RARE and yet, have it WELL DONE? being a PayPal member, too. Contact me, about other gifts through this form or just leave me a comment about my site....Thanks!